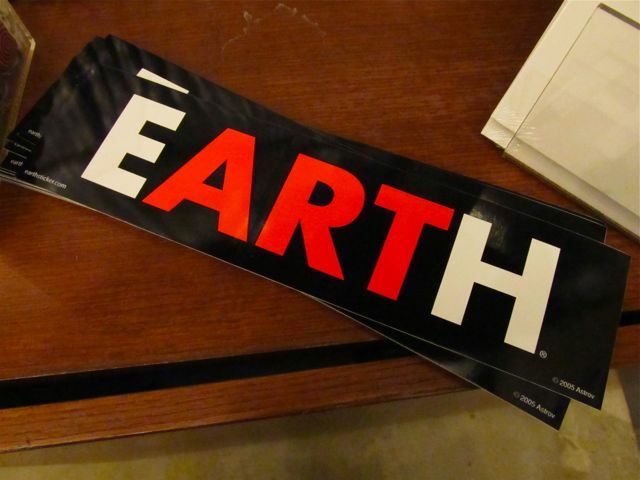 Letters form words within words — Earth/Art bumper sticker. 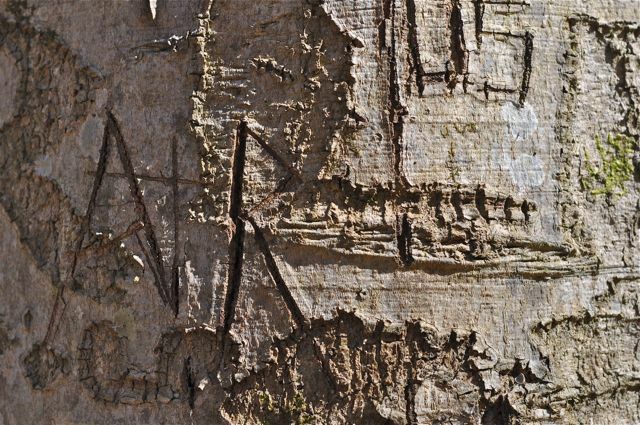 On the subject of earth and art (two of my favorite things by the way), here’s another example of ‘letters’ — this time on a tree trunk. Tree trunk carving… ouch, I don’t think we should do that. 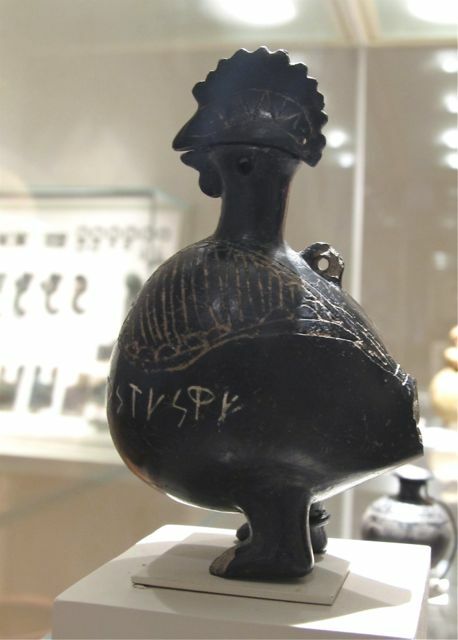 Met Museum, NYC, Etruscan vase in the shape of a cockerel. Of course, ‘letter’ doesn’t just refer to a sign or symbol, or a unit of a word we use to communicate, it’s also the term for a finished product. Remember ‘letters’? They’re what we wrote to each other before email and texts. I saved dozens that my mother wrote to me over the years, and when I sort through papers here at the house, I find I often saved old letters from other family and friends. The loops and dips of handwriting are so personal, that seeing them brings people and relationships back in an immediate and sometimes overpoweringly emotional way. I used to have a nice collection of stationery and note cards, but that’s no downsizing challenge. I’ve already packed up those supplies and passed them on to friends who are still so civilized as to write letters. When was the last time you wrote a letter? And (don’t answer this one, just think about it) — who does your laundry? “collected” was cleaning supplies. 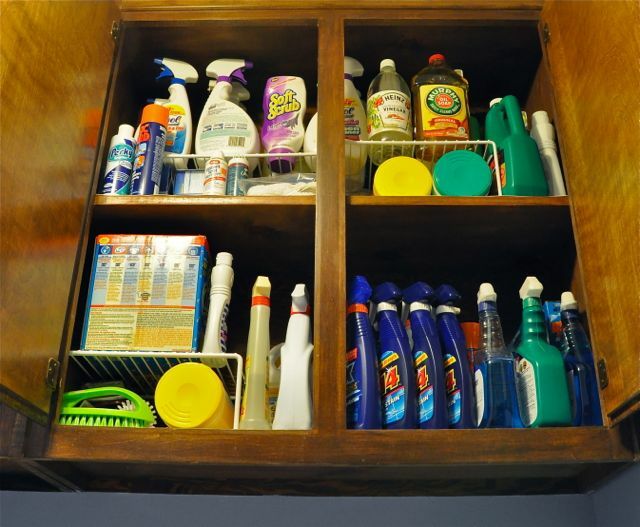 My reserve supply is proof: here’s what’s left of the cleaning-hoard in the cabinets on top of my washer/dryer. Here’s what I have left after 8 years of cleaning, and donating supplies. And that’s the tip of the iceberg on mildew-cleaner (front row). He had a thing about mold and scrubbed the showers often. After Bob’s death I had to face the basement alone. His collection of cleaning supplies took up so much space that I moved a lot to the garage shelves just to clear a path. I made up boxes of things to give friends, and to donate, and as time went by, I set about using things up. The amount of paper products was staggering. 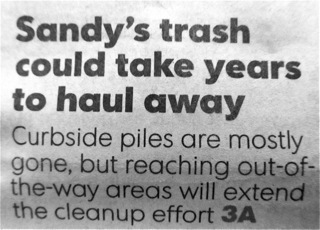 If I hadn’t given away so many paper towels, I’d have enough for at least three lifetimes. A domino effect of cabinet/garage cleaning (still not finished, so no after-photos yet) resulted in my realization that I might fit this stuff into one cabinet. So this is it, minus the paper towels and … well, several things stowed under the appropriate sinks. I’d like to switch to the newer eco-friendly cleaners, but if I give the old ones away, they’ll still be “out there”, so I suppose I should use them up myself. Last year I noticed too late that on Earth Day, Whole Foods invited customers to bring in old (harsh) cleaning supplies and trade them for new (eco-friendly) ones. I’m hoping the offer’s available again tomorrow; I’d like to take them up on it. But, I’d also like to know what they”ll do with the old stuff. Meanwhile, I’m eager to try soap nuts, which I learned about on A Steward’s Heart blog. As for my cabinet of supplies, I’m glad it’s semi-organized. And just to prove that I’m still working on my monumental task (see previous post), here’s a photo of something that once was on top of a real monument. Do you know which monument this belongs to? See more from the WordPress Weekly Photo Challenge: On Top. What do Stonehenge, the Sphinx, the Mona Lisa, and my basement have in common? I’m hoping that the job of cleaning out my basement is a little like visiting those monuments: once I actually get to it, I’ll find out it’s not as big as I thought. 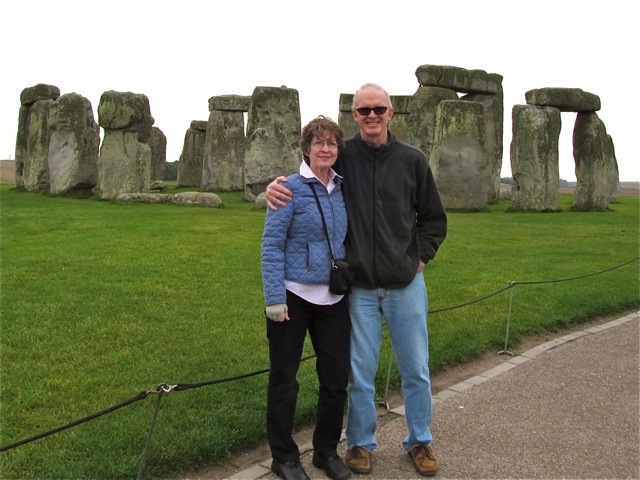 Perhaps this Stonehenge/basement-monumentality thing is a stretch, but consider: I first went to Stonehenge back when tourists could walk among the stones, so I know how big it is. Now the massive stones are roped off, always in the distance. Viewed objectively, they don’t look as big. As for my basement, I was here before it got filled up. I saw the collection of stuff grow to hugeness, and worried and fretted the entire time. I still put off going down there whenever I can, so it’s built up in my mind now, like a monument in my imagination. It’s hard for me to see it as it is. Sometimes I get discouraged that it’s taking me so long to clear out the house. 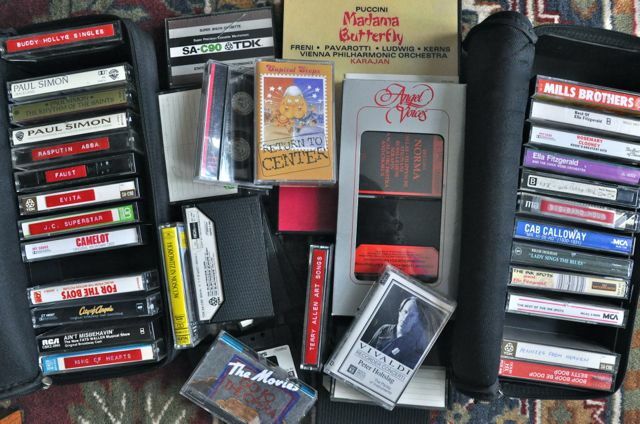 In my last few posts, I wrote about sorting cassette tapes and suitcases. I was having fun with that. 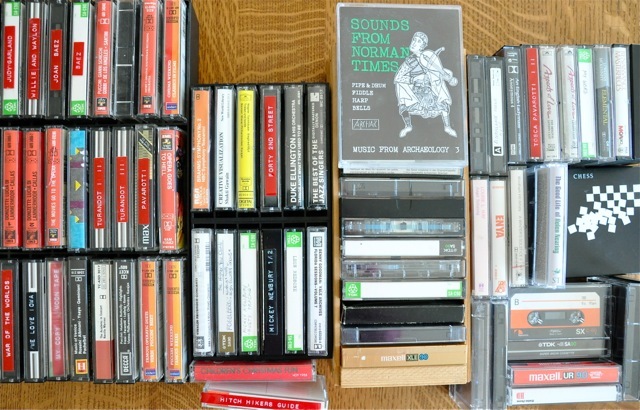 Then, a few days ago I found yet another trove of cassettes. Yesterday I found two more suitcases… I’m getting a bad case of when-will-it-end syndrome. On the bright side, among that last batch of cassettes were three boxed sets that looked so good that I tried listing them on Amazon.com, and I’ve already sold one (a Pavarotti/Freni (La Boheme). So, I continue to pick away at my monumental job … Perhaps I need to concentrate on developing that other great quality of monuments: patience. P.S. 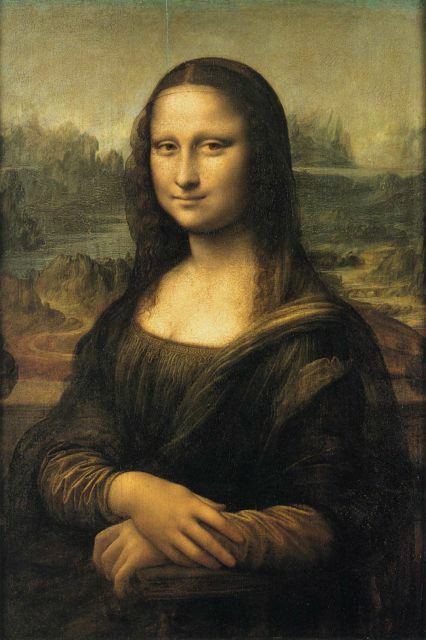 Do you know how big the Mona Lisa is? What do I take with me when I step over the threshold and leave my house? Why… my suitcase, of course. Yep, here we go with the hoarder stuff again. I went a little suitcase-mad lately and bought 2 new bags, so I’ve dragged out all the old ones for evaluation: something’s gotta go. 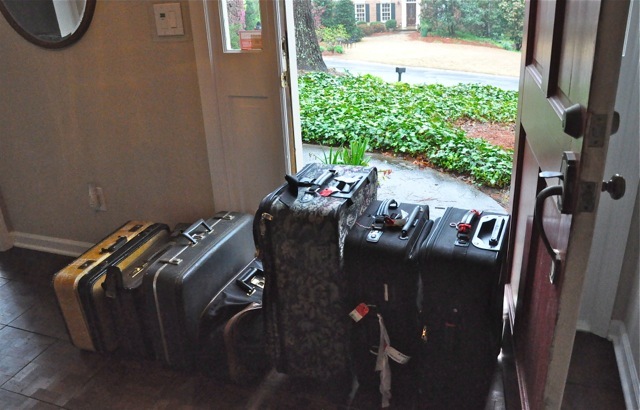 Suitcases on the threshold, ready for adventure. A rainy day and the evolution of carry-on bags. Buying new luggage was a guilty pleasure I succumbed to because my old carry-on is getting hard to pull. Now I have a “spinner” that can fit sideways down an airplane aisle, and is easier to handle in the airport or the street. I also bought a weekend bag with a padded laptop section. As for such self-indulgence, at this point, if it makes life simpler and easier, that’s justification enough for me. The tan one on the left is full of doll clothes (!) — I found it in my mother’s closet after her death. She made these for my dolls when I was a child. I couldn’t bear to go through them then, and put them away in the top of the closet until today. My dolls had clothes to match the ones she made for me. 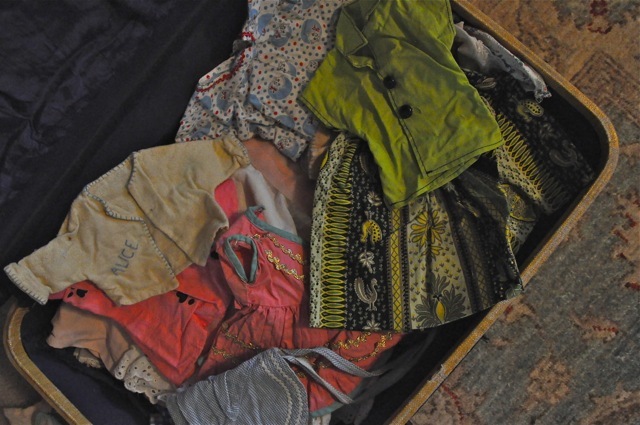 I’m still not ready to sort out the doll clothes, I just peeked inside long enough to take this picture. The next suitcase is an old (empty) one of Bob’s. The gray one third from the left is full of photos and papers some from 30+ years ago , and it’s a bit scary to realize it’s been with me, apparently unopened, through three moves. I’d forgotten it existed. The next was another of Bob’s early ones. 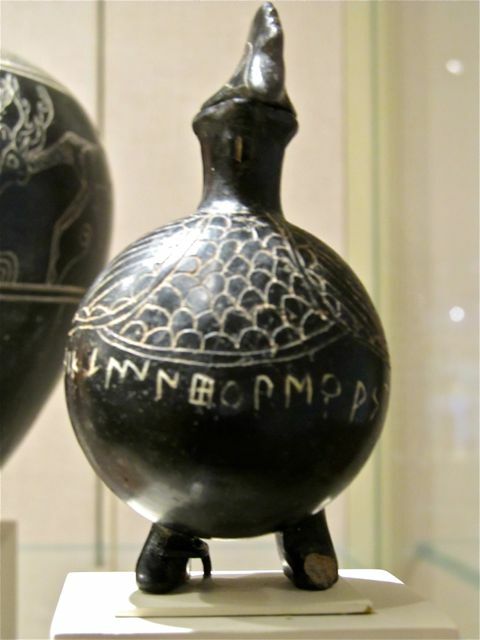 I remember its presence in Greece, Belgium, Germany and France in our pass-riding days. I had a similar one, and a separate fold-out trolley to wheel it on, back before carry-on’s came with wheels. Next is a larger bag I bought once as part of a set, then Bob’s black roll-aboard, and my roll-aboard imitation. My first wheeled carry-on is a missing link in this evolution of suitcases. I couldn’t find it, so I must have donated it already. Like the new spinner bags, it fit the narrow way down an airplane aisle. It also fit under the seat in front of me (seats were bigger). It had a handle like a leash and followed behind me, making it a hazard in crowds. It’s good to have a spare one just in “case” (sorry) the current one malfunctions or gets lost. They’re handy receptacles for accumulating loads of things you’re getting ready to take away. I’ve already used and delivered three with one-way loads of mementos taken to family members in other states. What’s your best use for extra suitcases? 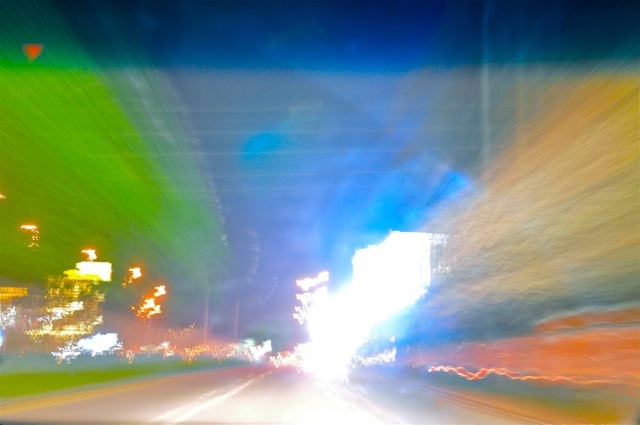 See the WordPress Weekly Photo Challenge for more on thresholds. Street Life: early morning on West Peachtree. I gave these to a friend’s niece. 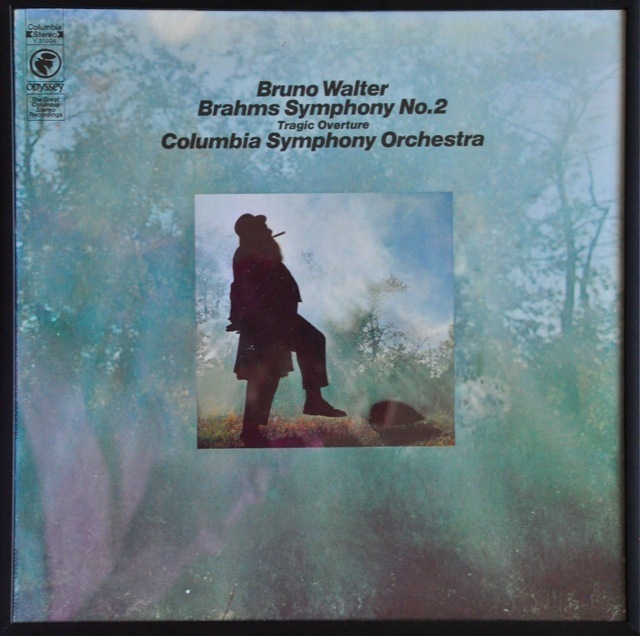 Record albums – recently donated. Here’s how quickly time flies… It doesn’t seem that long ago that I was playing these on the turntable of my stereo component set. After record players came cassette decks, so of course we all replaced our favorite records with tapes. Then time flew on and we replaced those with CDs, with the wasteful result that people sometimes ended up with the same work in three formats. Frustrated, I quit updating my stereo components and just listened in the car or on my computer until iPods came along. One good thing about keeping my vinyl records so long: they’re back! Now there are people who actually want them. I just gave a friend’s niece two boxes full. Even my library is featuring them, so I’ll donate some to them too. 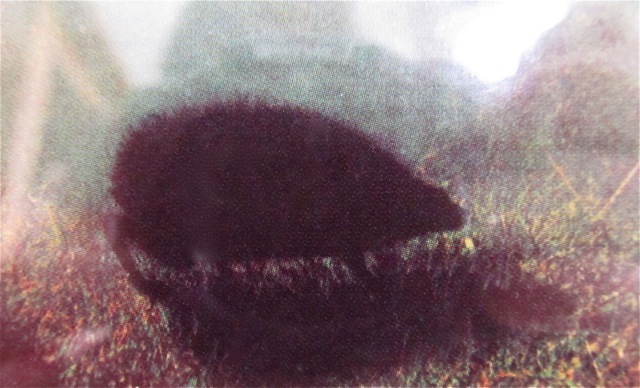 The theory here is that Brahms favorite tavern in Vienna was called the Red Hedgehog. Bob had lots of cassettes. I donated dozens of them a few years ago, and this week found these (mostly mine) tucked away in a cabinet. I’m not going to wait for hipsters to go cassette-crazy, I’ll just donate them now and trust that the right people will find them. — and yes, in regard to Sounds from Norman Times, I like to think that, hundreds of years ago, the Normans sat around recording cassettes for archeologists to discover in the 1980’s. I may have to listen to a few of these before I donate them. Where do you think the music migration will go after the cloud? Will we have blue-sky music?